Like the Inchbrakies and Garvocks this ancient family has descended in line male to the 20th century without a break. For its descent from the founder we refer the reader to the Sketch of Descent" where it may be traced from the 5th to the 5th centuries, when Sir William Grame Lord of Kincardine, married, for his second wife, a Princess of the Blood –Royal Mariota, daughter of King Robert III; Crawford tells us this lady had first married George, Earl of Angus, "a valiant man"; the Lady Mariota was left by him a widow with a little boy William, who became Earl of Angus, and a daughter who became ancestress, by her marriage with Sir William Hay of Lockhart, of the Earls of Tweedal. On his death, she married Sir James Kennedy; the Lady Mariota married for her third husband the ancestor of the Grahams of Fintry, and for her fourth, Sir William Edmonstone of Duntreath! Sir William Grame of Kincardine and his second wife had five sons. For this Robert, exchanged the lands of Strathcarron for those of Fintry; these latter lands were in turn exchanged for others in Forfarshire of a different name; it appears the Grahams of Fintry always retained that designation no matter what lands were sold or exchanged. It is stated this concession is in the original charter, and when the first Duke of Montrose in the reign of Queen Anne, took with other titles, that of Baron Fintry, a courteous requet was made to David Graham, then 10th of Fintry regarding the matter. An indenture between Patrick, Lord Graham, and Robert Graham, styled of Ballargus in 1460, grants to Robert the Lordship of Fintry. It is a matter for regret that masses of the family documents are in Capetown and inaccessible for this work, so that many facts of interest are necessarily excluded from this sketch which must remove the personality from much of the history of the family, but owing to the assistance of Mr Graham of Fintry many of the documents in England have been placed at my disposal. Robert, first of Fintry, married Jonete; she was the daughter of Richard Lovel of Balumlie in Forfarshire, by his wife, Catherine, the famous daughter of Sir Henry Douglas of Lochleven. She it was who thrust her beautiful arm into the bolt of the door in her endeavour to prevent the assassins reaching King James I; her daughter, Jonete Lovel and Robert Graham had three sons and two daughters; we pass for the moment Robert and his heir and take the younger children. (David his eldest son died without issue). John Graham of Balorgus, his second son, became ancestor of the Grahams of Claverhouse and of Duntroon. Elizabeth, his eldest daughter, married John Erskine of Dun; and his second daughter Margaret married Andrew Haliburton of Pitcur. Robert Graham married a second time, a lady of the name of Matilda, by her he had no children. Amongst the family papers is a letter from "Ballumie," dated 1699, a printed notice is affixed which states that Mr Erskine (who purchased Fintry from the 12th Laird, altering its name to the older one of Linlathen) has placed a stone coffin slab, bearing the arms of Fintry and Lovell of Ballumie in the burial-place of the Fintry Grahams. This memorial in stone commemorating the marriage of the first laird of Fintry was discovered built into the "Castle of Mains." His seal in the year 1478 is represented in Mr D. Laing’s ancient Scottish Seals, and was exhibited in the Heraldic Exhibition of Edinburgh in 1891. He married Lady Elizabeth Douglas, daughter of Sir George Douglas, "a man of great parts," as Crawford tells us. He concluded a peace at Berwick between the English and Scotch, and was made Warden on the East and Middle Marches; in 1457 James II sent him to subdue the East of Douglas, then in rebellion, for his services in this matter and many others, Sir George was given grant of the Barony and Lordship of Douglas and succeeded his nephew as Earl of Douglas. Robert Graham's indenture or cotract of marriageis betweeen himself and the Lord Dougals, Earl of Angus, his future brother in law; this points to the fact that the fathers of both bride and bridegroom were dead at the date of the marriage. The contract goes on to state that "Robert of Fintrie" has to wife Elizabeth of Douglas, sister to the Earl; or failing her, Margaret; whom failing, Pelys; whom failing, Elysoum; and that should Robert predecease the marriage, then David, his brother-german should marry whichever of the four sisters was "most expedient". The document which I have seen is dated 1476. Robert’s marriage to Elizabeth took place. Her elder sister Anne had married William, Lord Grame, Robert’s second cousin, and became the mother of the first Earl of Montrose. The unusual point in the endenture is that the contract is between the second son Robert in the first place, David, who is the eldest son (as stated above)coming second. As Robert is styled "of Fintrie" in the contract it would appear that David must have been a younger and not an elder brother as stated in the family pedigree. It is stated that David’s marriage took place with a daughter of the first Earl of Montrose, by his first wife, and he was put in possession or had sasine of "Fyntrie" Stirling, in 1495, and "Bocklify-Graham and Fyntrie" in 1500, and had by his wife at least one son. He married first, Katherine Bethune, daughter of John Bethune of Balfour, and sister of David, the famous Cardinal Archbishop of St Andrews, and Chancellor of Scotland. William Graham and his wife Katherine had three sons of whom we know David succeeded; Walter and James were the two younger. He was knighted by one of the James’s, Kings of Scotland (probably James VI) and married Margaret Ogilvy, daughter of James, fourth Lord Ogilvy, and by her had a family of three sons and one daughter, David, William, and James; their daughter Alison married John Crichton of Innernyte. A letter dated at the Castle of Stirling 1584, bearing the autograph of King James VI, states, that understanding Sir David Graham of Fintry, Knight, is "aiget and subject to divers infirmities and sickness of body where withal he may not sustain the paines and travels of our wars without extreme personal danger," the king, with consent of his Secret Council, grants permission to David to remain at home provided he sends his sons for him accompanied by his usual armed attendants. Married Barbara, daughter of Sir James Scott of Balwearie. This lady, a lineal descendant of the celebrated Sir Michael Scott, was a cousin of Margaret Scott (the heiress of Monzie, who married first Drummond of Carnock and then Patrick the third Great Baron of Inchbrakie). David had two sons, David, and James who was called "Captain James Graeme of Monorgan" and Craigo; he is mentioned in the Register of the Privy Council. It will be remembered these lands of Craigo had been held by the first Great Baron of Inchbrakie. This David, the sixth, unhappily became involved with his kinsman the Earl of Angus, and the Earl of Errol, with other Roman Catholics, to overthrow the established religion of the country; this plot was called the "Spanish Blanks." Previous to 1578, Robert Graeme, younger of Inchbrakie, Archdeacon of Ross, David of Fintry’s kinsman, had been cautioner for him to the tune of 5000 merks, in company with William Graham of Claverhouse and Robert Graham of Thornik. David Graham must have been a man of fine intellect; anyone who has seen the quaint little album on which are emblazoned the coats and signatures of his friends (probably also his fellow-conspirators), must feel that he had more cultivated tastes than were usual at that period; he paid the penalty of his conviction or temerity, and a quaint old journal records that on "Thursday, Feb, 15th, Sir David Graham of Fintry was capitally convicted and on Friday was beheaded at the Mercat Cross of Edinburgh, 1592." William Guthrie continues if Sir David had not made "his confession he would have been tortured as poor George Ker had been and he therefore chose the more easy death by execution." By this date, Fintry had several cadets established in various parts of the country. We have already mentioned John Graham, son of the first of Fintry who founded the House of Claverhouse, from whom spring Duntroon and Balorgus. There had also been younger sons of William the fourth of Fintry, Walter and James, and also William and James of the fifth of Fintry; of course it was not necessary that each of these should have founded a house; but an old genealogy of Orkney states that besides those already mentioned, the Grahams of Pottento, Gogar and Claypots were all descended of Fintry, while James the second son of this David the sixth is styled of Monorgan and Craigo. And a second daughter who married James Kinloch who succeeded his father in 1617; this lady’s Christian name has not come down to posterity. who succeeded in turn to the lands of Fintry; it is in 1626 we again meet David’s name, attending the funeral of his chief (the father of the great marquis) who died on 12th November of that year, and in 1629 when the young earl is visiting his various kinsmen and friends, Fintry is one of the country houses where he is a welcome guest. At this period Fintry is one of Montrose’s curators and sends him the gift of a hawk, the messenger gets 29s.0d. David’s signature is on a discharge in 1632, by Montrose to the lands and barony of Culgask, which now belonged to the Oliphants of Gask; he spells his name David Grahame of Fintre, and he is still alive in 1666, as we shall show later on; meanwhile he was devoted to the royal house of Stewart and (like all Montrose’s kinsmen) to his chief. Trusty and welbeloved We greet you well. Hearing of some unlau meetings and convocations of our subjects within the Sherrifdom of Fforfarr: Our pleasure is that bt ye charge you have of Us as Sherriff thereof you stopp all such unlau meetings within the same, and in so far as in you lyeth, all such Companies of people not being warranted by lau authoritie as intend to pass through the same, or any part thereof, And to this effect that you raise to yor assistance all or good subjects within that Shire, whereof do not you fail, as you will answer at yor highest perrill. We bid you farewell. From or Court at Whitehall 27 February 1639. Trusty and well-beloved Counsillour We greet you well. Whereas there is a desperate Rebellion burst forth in that Our Kingdome by the Procurement of some few that have so farre prevailed with divers of Or subjects there, as to make them ryse in Armes and enter into this Kingdom to give Ayde and Assistance to such as have risen up against us here; We are constrained (for eschuing the imminent and unavoidable Danagers, wherewith, by this means the subjects of both Kingdomes are threatened) to employ the Power and forces of such, as, Wee are confident, have in horrour and detestation those treacherous and disloyall Proceedings against the Violence and malice of those that ayme so directly at the Ruine of Us and Our Authority. Wherefore being particularly informed of your good affection towards Us and Our service We behoved to take speciall notice thereof, and withal to incite you to give Proofe and evidence thereof at this tyme, by concurring and helping those that Wee have authorized with Commissions within the bounds wherein you shall have your residence, Whensoever any Opportunity shall be offered and you required by them for that effect. Wherein not doubting but to find your forwardnesse, and in all things else to be imparted to you from them, concerning the good of our Affayres, We bid you heartily Farewell. Given at our Court at Oxford the 5th day of February in the Nynteenth years of our Reigne. This letter was written about 1646. About the same period Montrose is staying at his house of Kincardine, he writes to David Graham of Fintry’s brother who, it will be remembered, is called James Graeme of Monorgan and Craigo, and desires his assistance for arranging matters at Old Montrose. Yr very loving chief, Montrose. I must earnestly intreat you to contrive that Mackintosh doe not dishonor himself and wrong us all by being thus abused with Argyle. Montrose (afterwards the Great Marquis) is much annoyed with this Mackintosh who is married to a daughter of David, seventh of Fintry, and the niece of James Graeme of Craigo, and who inclines to follow Argyle. It is strange that most of the cadets of Fintry spelt their name correctly (as shown by the above letter), but the head of that house spelt it with the "aha." In 1647 David is a creditor of Montrose with James Graham of Monorgund. Montrose has left the country by this date and no doubt settlements of various kinds are in progress. All the Graemes and Grahams had, in 1645, obtained a remission in favour of any debt Montrose owed to them previous to the forfalture of the Marquis's estates. For my honerable and luving friendes the Lairds of Fintry, Morphy Inchbrakie, Gorthy, Balgowan, Craigo and others. What a quaint turn in the sentence where he trusts "your people may calme their malice!" Montrose will not touch a penny of his estate until his kinsmen are freed from their burdens. In 1650 the Great Marquis is murdered for loyalty to his king, and after that we find David's name in a will of Forret's (Montrose's old tutor) in 1652, to whom he owes some money; and again when he writes a letter to "his brother the Laird of Monorgan," dated from Kirremur the 4th of August that year. In October 1654 Cobbet grants at Dundee a pass to James Graham, the second son of David, who has found obligations that he would remain passive, this Captain James figures again as a witness in the following document, when David Graham of Fintry "gives a charter with John 'fiar' of Fintry, with consent of Dame Jean Scrimgeour wife of John," to James Graham of Monorgund, of the lands of Erlestradiche in the regality and barony of Kirriemuir, Forfar; and one of the witnesses is Captain James Grahame, David's second son. It would appear from this that Monorgan was not yet in the hands of Fintry's son, but in his uncle James's. When the Great Obsequies of Montrose occur, it is this David, seventh of Fintry, who bears the Purse, and James, his second son, now called James Graham of Bucklivy who bears the Arms in mourning. Once more we meet David Graham, seventh Laird of Fintry, his estates have been much wasted by the Montrose wars, as have been those of all his kinsmen; he sells the Barony of Bochlyvie-Grahame, with all its towns, lands, etc., to James Graeme, the second son of Graeme of Monzie (a grandson of Inchbrakie and Miss Scott of Monzie), this with the consent of his sons John, "fiar" of Fintry, and James Graham (now) of Monorgan, his second son; the original charter with the remains of the Great Seal attached, lies before me, 8th Feb. 1666. By this date James, first of Monorgund, is dead, for David's second son James has succeeded to those lands; and on 15th December 1664, Agneta Grahame had been retoured heir to her father James Grahame of Monorgund; and four years later (1669) we find the same lady is the spouse of William Lindsay " fiar" of Edzell. In 1666 David of Fintry must have been well on in years, he had succeeded his father in 1592 and was, we believe, married at that date; but his successor and eldest son is not served heir to his father David till Sept. 11th, I675. There seems little to relate. One of the pedigrees state "he was a man of profuse and lavish disposition, and spent a great part of his patrimony during the Civil Wars therefore impoverishing his estates"; that may be, but it depends upon the view taken of the Civil Wars whatever the motive which animated him was worthy or not; his father appears to have done much the same. John married Jean, a daughter of the Hereditary Constable of Dundee and Royal Standard Bearer, Sir James Scrimgeour; Sir James was afterwards raised to the Peerage as Viscount Dudhope in 1641; his grandson was created Earl of Dundee; these titles are in abeyance, represented by Frederick Scrymgeour of Wedderburn and Birkhill. It was while the "boy Earl" of Montrose was staying with John Graham of Fintry’s father-in-law, that we find in him that touch of nature which makes the whole world kin. Sir James’s gardener supplies a flower for "my Lord on Sunday," and gets 12a. for his pains, and the Earl goes, bedecked as a young gallant should be, to church at Dundee, where he bestows his alms! We can picture him clearly at this age by Jamieson’s portrait of him when a bridegroom of nineteen. In 1654 John was still "fiar" there had been "articles" between General Monck and "Sir Robert Graham, Laird of Morphie," for the second Marquis of Montrose, known as "James the good" (the boy who refused his release from the Tolbooth of Edinburgh) which are also signed by the heir of Fintry. John Graham and his wife Jean Scrymgeour had no surviving issue, and he was succeeded by his brother. For the Laird of Monorgan. It is possible that the above letter was written to the James of Monorgan who was in the charter of 1655, and uncle of this James, ninth of Fintry, but it cannot be better placed than here, nothing can detract from the undoubted loyalty of the nephew afterwards ninth of Fintry as shown by the following permit given him in 1654 from General Monck, and other papers. Permitt the berearer hereof, Captain James Graham, sonne to the Laird of Fentry the elder (who is included in the earl Marquis of Montrose's capitulacon) to passe to his father's house, or;elsewhere in Scotland; and to repasse without molestation . He doing nothing prejudiciall to the Commonwealth, and to have with him his servants, horses (not exceeding the value limited by proclamation) his sword and necessaries. 21 Novbr. 1654 George Monck. To all officers and soldrs and other whom these may concerne. Like Oliphant Laird of Gask, Graham of Fintry and Monorgan is a Roman Catholic; in the year 1662 he also is granted a Lenten dispensation "with those at his own table" to take meat during the season of that fast. It is dated at Edinburgh, Feb. 1662, and signed by Blakall. His loyalty is again shown by Charles II. 's Commission to him as Major of the Forfarshire Regiment (under Lord Southesk); his brother John is still laird of Fintry. CHARLES THE SECOND, by the Grace of God, King of Scotland, England, France and Ireland, Defender of the Faith, &c. To Our Trusty and Well-Beloved, James Graham of Monorgan, Greeting ; We do hereby constitute and appoint you to be Major of that Regiment of foote appointed to be raised, within the shyre of Forfar, whereof the Earle of Southesk is Colonell. You are therefore carefully and diligently, to discharge the duty of a Major, by exercising the said Regiment in armes both officers and soldiers, and to keep them in good order and discipline. Commanding them hereby, to obby you, as their Major, And yourself to observe such orders and directions as you shall from time to time receive from your Colonell, or other superior officers according to the discipline of Warre. Given at Our Court at Whitehall the 2nd day of Decr. 1669, and of Our reigne the 21st years. At the head of the original document is Charles's handwriting; it is on parchment and has a well-preserved seal attached. Later on he was appointed Lieut.-Colonel in place of Carnegie of Bonnymoone when the Earl of Kinghorne was Colonel. James Graham of Fintry and Monorgan married Anne, daughter of Hay of Keilour; Keilour lies close to Balgowan and was owned by the Hays for a time; it was bought from them about 1700 by one of the Graemes of Gorthie; the Hays of Keilour were a branch of the Earls of Errol and ultimately succeeded to the title. James and Anne Graham appear to have been holding the position of guardian or curator to James the third Marquis of Montrose, who in 1678 seems to have taken French leave and is bent on going abroad, a step which Monorgan has not hitherto approved. The following letters bear apology on their face! Your most affectionate cousin and servant Montrose. Be pleased to present my most humble to yr Lady & to conceall this from my ant and sisters till wt the next post I shall be able to give them an account of it for the Laird of Monorgan. In the letter to "Lady" Monorgan the Marquis refers his sisters; the youngest, Grizel, married afterwards William, second son of Lord Cochrane and was the mother of Mrs Smythe of Methven Castle. (5) Margaret, married to her cousin, Sir David Kinloch of Kinloch, first bart. The Brechin records in April 1698 speak of a Hendrie Graham of Monorgan, godfather of Henry Edgar of Kaythick, afterwards third and last Bishop of Fife, he must have been second son of the ninth laird. It is stated that James, ninth of Fintry, refused a baronetcy from Charles II; it is certain either he or his father did so; these baronetcies were offered by Charles after 1662; David of Fintry his father was then alive, and would more probably be the recipient; like Graeme of Inchbrakie he declined it; the prefix of "Sir" in the seventeenth century had no attraction for the great barons of Scotland. This baron of Fintry received a bond of relief of various large sums of money from many of his kinsmen; besides James, Marquis of Montrose, Earl of Kincardine and Lord Graham and Mugdock, the names of the following Grahams figure in the deed: John Grahame of Killearne, James Graham of Orchill, Mungo Graeme of Gorthy, John Graham of Dougaldston, David Graeme, tutor to Gorthie, Clerk of the Bills, James Graeme of Bucklyvie, (of Inchbrakie), John Graham, son of the deceist John Graham, Commissary Clerk of Dunblane and "Director depute of the Chancellorie", and state that they have "paid and contented". Mr William Graham of Kilmarnock 50,000 Scots, and to James Boswell of Auchinleck, 13,000 pounds sterling, English money, it is signed by the Marquis on the 15th April 1704. Amongst the witnesses are Thomas Graham, late brigadier in the Horse Guards, and Mungo Buchanan, W.S. David the tenth of Fintry married Anne Moray of Abercairny; she was the eldest daughter of Annas Graeme (daughter of the famous Black Pate of Inchbrakie who was the bosom friend of the Great Marquis) and Sir Robert Moray of Abercairny, one of the wealthiest of the great barons of Perthshire; her younger sister married Graeme of Garvock, thus the Abercairny, Fintry, Garvock and Inchbrakie children were all (early in the 18th century) first cousins to each other and to the young Margaret, Baroness Bairne, who married in 1693 Lord William Murray, son to the Marquess of Atholl. Lillias to Wallace, who left no issue. David the 10th of Fintry appears to have gone out in 1715, against William of Orange. His protection from the Duke of Argyll dated at Dundee 4th February 1715, is among the Fintry papers. The only son of David and Anne Moray, was married the 20th February 1735 at Dundee to Margaret Murray of Ochtertyre; she was born in 1716 and was one of the 19 children of Sir William Murray of Ochtertyre (10th in line and 3rd baronet) and Mrs Catherine Fraser, daughter of Lord Lovatt. I give their children as written in an old MS pedigree of Ochtertyre most carefully kept and which has generally been found to correct; the marriages, etc. in brackets attatchewd to their names, are from a family pedigree of Fintry which gives no dates. Katherine born at the Mains, 1737, (she died unmarried at Linlathen at the residence of her brother, April 13th 1764 and is called Miss Kathy Graham, second daughter of the late Robert Graham of Fintry). This pedigree omits the birth Robert (12th of Fintry) probably in 1741/43. There was also a son James born 1756; he died at Naples in 1779 a captain in the Atholl Highlanders. Their grandmother, Catherine Fraser, had been the daughter of Lord Lovat by the Lady Amelia Murray, daughter of the first Marquess of Atholl, whose wife, Lady Amelia Stanley, was daughter to the Earl of Derby and his Countess, Charlotte de la Tremouille, Queen in Man; the grahams of Fintry own a piece of the wedding dress of this celebrated lady who commanded personally the defence of Lathom Castle during the absence of her husband, the Earl of Derby. These marriage connections account for the following among the Fintry papers. In 1663 Mungo Murray, brother to the Earl of Atholl, signs a bond in 1663, at the Canongate, Edinburgh, for money due by him to William Murray of Ochtertyre. Also there is a bond which details the purchase of a horse by Lord Mungo Murray from William, Lord Nairne, "our brother German," which costs loo merks on 23rd June 1799. Another and more interesting paper gives a full account of the battle of Galashiels, when the Chevalier St George acting with the Spanish, failed in an invasion of Scotland in April 1719. Their force consisted of 400 Spanish and 1000 Highlanders. The Marquis of Tullibardine (the Jacobite son of the Whig Duke), the Earl Marischall and Seaforth were leaders. Robert Graham died at his house of Linlathen, Forfar, on October 21st, 1756, aged fifty-five, and was succeeded by his son; his widow died at Bridgetown, 24th January 1793. TWELFTH AND LAST OF FINTRY LANDS. The first notice I find is on March 10th, 1773. A county meeting is held at Forfar and Robert Graham of Entry and Mr Graham, younger, of Methie are publicly thanked for their spirited behaviour in assisting to stop the outrages of the mob. He married a second cousin of his own (the grand-daughter of Miss Isabella Graham, sister of tenth Laird of Finery), by name Margaret Elizabeth Mylne of Mylnefield, at Dundee, Robert Graham of Fintrie to Miss Peggy Mylne, second daughter of T. Mylne of Mylnefield, Esq., April 12th 1773. The family pedigree states this laird was very improvident and sold the estates. Finny was sold to Mr David Erskine and the stipulation was made it should be called by its original name of Linlathen, the family retaining in this manner the designation "of Fintry." Robert Graham then resided at Balgowan where he may have acted as supervisor to that estate during the long and continued absence of Thomas Graeme, Colonel of the 9oth Regiment, afterwards Lord Lynedoch. There is a mass of correspondence between Thomas Graeme and this Robert, twelfth of Fintry, which I have not seen, so am unable to throw any light on his reason for residing at Balgowan, beyond the fact that they were great friends; in the cursory search time has permitted, no relationship is traced of blood between Robert and Thomas Graham. The following letter from Lord Lynedoch is given as being of a specially interesting nature, recording as it does the death of the great General, Sir John Moore; Lynedoch, who at this time commanded the 90th Regiment, was near him, John Graham being his aide-de-camp. I had not time nor the power, to write from Coruna my dear Graham -for I wasalmost blind with an attack of Opthalmia. but I directed Ld. Cathcart to communicate to you what I said to him in two lines .--Before this can reach you, Hope’s report to Sir D. Baird will have informed you of what happened on the 16th - But for the sad loss of the most perfect soldier and gentleman I ever knew, it war a most fortunate circumstance that the enemy made the attack.- It was what he (Sir J. M.) earnestly wished. - I never saw him in such spirits as when their columns were advancing and that it was evident the attack was to be a serious one- and he only regretted that there would not be daylight enough to profit much of the advantages he anticipated as certain. The enemy did not expect to meet with such a resistance their attack was impetuous- entirely directed against one point(our right) in the first instance, and was in fact defeated by Lord William Bentinck’s brigade with the left of which Sir John remained ?speaking to the 42nd and reminding them of what they had done on former occasions- while it lasted the fire was extremely hot -the enemy had great advantages in artillery?most of ours was embarked, theirs entirely commanded the right of our bad (but necessary) position, and it was admirably well served-with some hours of daylight. I have no doubt but that a complete victory would have been obtained, as ‘Paget’s division had nearly turned their left and might have been supported by Fraser’s-not at all engaged-our left was so strong as to be almost in attaquable and therefore many men might have been drawn from it in the advance?the whole of the enemy’s position was strong-but their left was least so-adieu. Besides Graeme of Balgowan, the hero of Barossa, Rohert Graham had a warm admirer in one who (though in a humbler walk of life) was even more celebrated, Robert Burns, Scotland’s greatest poet; Mr Graham had been a kind friend to Burns rendering him some assistance, and the poet never forgot it. TO MRS GRAHAM OF FINTRY. It is probable, Madam, that this page may be read when the hand that now writes it, is mouldering in the dust - May it then bear witness, that I present you these volumes, as a tribute of gratitude, on my part, ardent & sincere; as your & Mr Graham’s goodness to me has been generous & noble!--May every child of yours, in the hour of need, find such a FRIEND, as I shall teach every child of mine that their father found in YOU! Burns wrote many letters to his benefactors and sent them several of his MS. poems; amongst these are "Tam o’ Shanter- " and "The Whistle." Robert, twelfth laird, died at Balgowan, 1812; he left a numerous family by his wife, Miss Mylne. Robert, their eldest son, H.E.I. Company’s Service, was assassinated through the treachery of a native chief at Benares in 1799. John, who succeeded. Thomas, entered the Royal Navy, in which service he became a captain; he married Maria, daughter of Admiral Dundas of Dundas Manor, and died at Valparaiso in command of the Doris, 9th April 1882. He left no children. David d.s.p. ; James Scott died at Broughty Ferry, 1804; of Mr Robert Graham’s daughters seven (married) died young. Anne married 6th September 1809, General the Honable. J. Brodrick, son of George, third Viscount Middleton (she had by him a son who died unmarried, and three daughters; Anne, married in 1846 to Rev. William Pennefather, Rector of Callan (son of the Right Honble. Edward Pennefather) ; Mary Elizabeth, married 1858 Right Rev. Edmund Hobhouse, D.D., Bishop of Nelson, New Zealand; and Mary Albinia, married in 1851 to William James Dundas Cloete, Esq. Elizabeth, married to James Keay of Snaigow; Helen, who married Judge Cloete Cape of Good Hope; Jemima, married to General Dundas of the Royal Artillery (brother of Mrs Thomas Graham); Catherine. who married Colonel Briggs of the Indian Army; and lastly, Caroline, married Morton Carr, Esq., of the family of Esholt and Hyton Hall, Northumberland. served for many years in the 9oth and 93rd Regiments; he was afterwards employed in the wars against the Kaffirs at the Cape; he was born 24th of April 1778 he entered the 9oth when only sixteen years of age, and was present with the Expedition to the Isle de Dun in 1795. In 1797 he joined Colonel Graeme of Balgowan, who was aide-de-camp to the Earl of Chatham, and proceeded with him to Holland in 1799. Raising 100 men for the 93rd (Balgowan’s "Grey Breeks") he obtained a majority, and acted with that regiment in capturing the Cape of Good Hope in 1806; he held the command of the Rifle Corps at the Cape till 1812, when he went home on leave of absence, and joining Balgowan (then Lord Lynedoch) went with him to Holland as aide-de-camp and private military secretary in 1813. Resuming his command at the Cape in 1815 he was employed against the Kaffirs, a duty in which he gained the greatest distinction, so much so, that the capital of the Eastern Provinces of the Cape Colony is named after him (Grahamstown). Below is the order directing this from the Cape Government. His Excellency the Governor and Commander-in-Chief is pleased to notify and direct that the present Headquarter Cantonment of the Cape Regiment situated on the Zuurevelt, where is also to be the future Residence of the Deputy Landrost of Uitenhage, shall be henceforward designated and duly acknowledged by the name of Grahamstown-in testimony of His Excellency’s respect for the services of Lieut.-Colonel Graham, through whose able exertions the Caffre Tribes have been expelled from that valuable district. Castle of Good Hope, 14 August 1812.
by command of His Excellency the Governor. He also was made Commandant of Simonstown. Lieutenant-Colonel Graham’s life closed all too early; he died on the 17th March 1821 at the age of forty-two from over-fatigue, brought on by his untiring exertions in the service of the Colony. He married on the 24th July 1812, Joanna Cloete of Westerford, Cape of Good Hope, leaving a son Robert and three daughters, Johanna and Margaret; the third, Isabella, married Sebastian Vanrenen of High Constania. was for many years in the Government service at the Cape of Good Hope; in the Kaffir War of 1851-52, Colonel Graham raised a troop known as Graham's Horse; for this he received a medal. He had married in 1846 Eliza Ann Gray; her ancestor was Dr George Gray of Halkerton, who married Lady Jean Erskine, daughter of James, Earl of Buchan (an old branch of Lord Gray in Angus); their grandson, George Gray of Huntingdon, married Isabella Graham, grand - daughter of James Graham of Monorgan and Fintry (a grand-daughter of this marriage -Isabella Mylne ?married Robert, twelfth of Fintry) ; Mr George Gray married secondly, Miss Elizabeth Baird ; their son was Colonel Charles Gray, he commanded the 75th Regiment in Guzerat, where he died of fever; his son. Colonel Charles George Gray of the Rifle Brigade, married Jane (daughter of Colonel Grogan of Seafield), and their daughter, Eliza Anne, became the wife of Robert Graham, fourteenth of Fintry. They had a large family: John, their eldest son, we will take last; their second son Charles, died unmarried in 1876, as did their fourth son, Reginald Lawrence in 1878; Robert Dundas died in 1894, he married Eliza, daughter of J. Vique, Esq., and has left a daughter, Elysoon Douglas Graham; Mr and Mrs Graham’s daughters, Elizabeth Keay and Violet Emily, both died young ; their third surviving daughter Roberta, married in 1892 Edward Chamley-Turner, Lieutenant of the Ist Royal Scots, he died in September of the same year leaving no issue ,the youngest daughter, Albinia Ellen is unmarried. The remaining children of Colonel Graham, fourteenth of Fintry, and Eliza Anne his wife, are- Francis George Cathcart, second surviving son of Robert. fourteenth of Fintry was born in 1853; he is Civil Commissioner and Magistrate of Grahamstown (named so after his grandfather);Francis G. Graham married in 1892 Alice, daughter of J. Flashman, Esq., and has Kenneth Douglas, Reginald Moray, Dorothy Cathcart, Iris Lovell, Winifred Edith. The Honble. Thomas Lynedoch, third surviving son of Robert, fourteenth of Fintry, Barrister-at-Law of the Inner Temple, K.C. M.L.C, is the present (1903) Attorney General of Cape Colony; he was born in 1860 and married in 1891 Annye Ismena, daughter of the Rev. J. Gavin, Chaplain to the Forces in Bengal; their children are: Robert Lynedoch, Gray Gavin Lynedoch, and Ruth Annye. Malcolm David, the fourth surviving son of Robert, fourteenth of Fintry, was born in 1865; is a captain in the 1st Battalion Northamptonshire Regimen, he married Helen, daughter of Dr Abercrombie; Mrs Malcolm Graham died January 1903, their only child, John Alexander, was born 1898. Mary Cathcart, the eldest surviving daughter of Robert Graham, fourteenth of Fintry, married, in 1874, Hercules Tennant, Barrister-at-Law, and has issue: David Graham Tennant, Reginald Dundas Tennant, Violet Letitia Tennant, Beatrix Graham Tennant, Marjorie Katherine Tennant. Jane Leith Hay, second surviving daughter of Robert Graham, fourteenth of Fintry, married, in 1882, Lieutenant-Colonel Wihon, C.B., of the Argyle and Sutherland Highlanders, their children are Alexander Graham Wihon and Elizabeth E. A. Graham-Wihon. Helen Lilias, the fourth surviving daughter of Robert, fourteenth of Fintry, married in 1889 Andrew Aytoun, Major in the Argyle and Sutherland Highlanders: Major Aytoun descends from that ancient and honourable family the Aytouns of Inchdairnie, and is eleventh in line from that house; his grandmother was the daughter of Sinclair of Balgrygie, cadet of the Earls of Orkney; his great-grandmother was a daughter of Lord Rollo of Duncrub; his great-great-grandmother, Euphemia, was a daughter of Sir J. Ramsey of Whitehill; space forbids carrying on the line further here, but other mention of the Aytouns will be found in Sketch XXXV. Mr and Mrs Aytoun have an only son, Robert Martin Graham Aytoun. Margaret Elizabeth Keay, the fifth surviving daughter of Robert Graham, fourteenth of Fintry, married, in 1893, Major J. Scott, Argyle and Sutherland Highlanders, and has issue: Margaret Graham Scott and Violet Albinia Scott. Caroline Isabella, the sixth surviving daughter of Robert Graham, fourteenth of Fintry, married, in 1895, Major L. H. Orde, East Yorkshire Regiment, and has surviving issue: Dorothy Violet Orde and Leonard Roden Orde. Robert, born 1877, Cape Civil Service; James Mackay, born 1879; Malise Patrick, born 1885; Cosmo Moray, born 1887, is in the Royal Navy; Ronald David, born 1892; his surviving daughters are Ethel Jane and Marion Kinloch. 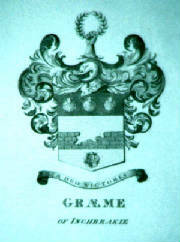 Mr Graham represents the honourable branch of Graham of Fintry descended from Montrose before that family was ennobled; is fifteenth in line male of Fintry and twenty-sixth in line male from William Graeme of Abercorn: Mr Graham shares this distinction of male descent throughout, with the House of, Graeme of Garvock, and with the House of, Graeme of Inchbrakie. Robert, the first of Fintry, had a second son John who was given the lands of Balargus, County Forfar; his son John became of Claverhouse; his great-grandson George left a son William Grahame of Claver’s, as these lands are commonly called; he married Lady Jean Carnegie, daughter of the first Earl of Northesk ; their eldest son was John Grahame, the famous Viscount Dundee. Napier’s "Life" records all interesting matter of the hero of Killiecrankice while young readers may be referred to Aytoun’s famous "Burial March of Dundee" with its interesting notes. The Historical MSS. Commission Report states that there are numerous letters in the Monteith muniments written by Claver’s "which far excel in force of expression and classical allusion, the style of ordinary correspondents." Sir Walter Scott’s hasty condemnation that Claver’s spelling would disgrace a chambermaid, is thus for ever refuted, Claver’.s had more than the ordinary education of the day. After his death at Killiecrankie, the widowed Viscountess Dundee married Alexander Livingstone Kilsyth (called Viscount Kilsyth) and with her infant son met a tragical fate in Holland : a Mr Stewart writes that the chamber above the room in which the Viscountess was sitting in the Castle of Antwerp at Utrecht, was stored with peat for fuel to 300 tons’ weight and that the joists of her chamber suddenly gave way; the Viscountess with her infant son and maid were buried in the ruins ; her husband was injured and so was Mr Walkinshaw of Barrowfield, but not fatally; another letter states the bodies were embalmed; this accident occurred on 16th October 1695 ; one hundred years later they were discovered in the family vault of Kilsyth in remarkable preservation ; " Bonnie Dundee’s" only son had died in infancy, 1689. These are a branch from Claverhouse and claimed the title of Viscount Dundee, which lies dormant, attainted in 1746. In the indices of this volume (page 662) will be found the will of Graham of Duntroon, son of James Graham "sometime chamberlayne to Claverhouse; the last heir-male, Alex. Graham of Duntrune, died between 1802-1804. He was succeeded by his four sisters: Anna and Alison died unmarried: Clementina married Gavin Drummond (twelfth child of James Drummond. second Laird of Keltie, by his wife Christian Hally of Kennedder) a captain in the 42nd Regiment, and left an only daughter Clementina Drummond; the fourth and youngest sister, Amelia, married Patrick Stirling, merchant; they left three children?I. Wiliam Stirling-Graham, which latter he assumed on succeeding to Duntrunne, he died without issue on 19th December 1844. II. Clementina Stirling Graham, who succeeded to Duntrune, and was the author of "Mystifications." III. Jean, who married John Mortlock Lacon, lieutenant 72nd Highlanders, son of Sir Ed. Lacon, first Baronet: their eldest son, John Edmund Lacon, succeeded to Duntrune on the death of his aunt Clementina Stirling-Graham in 1877, and by his marriage with Miss L. M. Sherwell. left an only son, Frederick Graham-Lacon, he married Miss Anne M. Hopper and died in 1875. Captain Graham-Lacon died 1894. Duntrune is now represented through the distaff by the only child of Frederick Graham-Lacon, Ida Clementina, who married James A. Wigan of Oakwood, Maidstone. It has been already stated that the Grahams of Pottento, Gogar and Claypots and Creekie were cadets of Fintry. The family of the Grahams of Methie were also descended from Fintry; many notices of this family have come to the author’s knowledge and various other cadets bear the arms and motto of Fintry, Inckbrakie, and Balgowan. 2. William J. F. Graham, Major in the Prussian Guards, Berlin, married Florence, only daughter of Francis Kellor, Esq., Imperial German Consul at Southampton. Their children are : William F. Graham, born 1886 ; Francis H. F. Graham, born 1889; John C. Graham, born 1893 ; Frederick G. Graham, born 1896 ; Charles Graham, born 1898, and a daughter. 3. William John Campbell Graham, M.D. of Bonn and F. R. Coll. of Surgeons, Edinburgh. He married Mary Jessie, daughter of Stephen Ponder, Esq. (seventh in direct line) of Elm Lodge, Hampton-on-Thames. He was president of the Thames Conservancy and a great mover of the endeavour to restore salmon to that river. They have a son, John Victor Fynn Graham, and four daughters. Dr Graham is a physician in Medan, Sumatra. Mr William Graham and Miss Fynn’s eldest son is the Rev. Francis Graham, M.A., Oxon. Ex-scholar of Lincoln Coll., Oxon. late Rector of Stanningfield, married to Hester, eldest daughter of Philip Johnston, Esq. of Dalriada, Belfast, descended of the Johnstons of Annandale. The Rev. Francis Graham bears the arms of Graham of Fintry. The bookplate of a Thomas Graeme shows the Inchbrakie arms, the new grant of 1650 giving the broken wall, with the arms of Blenman of Croscombe, Somerset, impaled. Jonathan Blenman, Esq., was H.M. Attorney-General for Barbadoes in the eighteenth century. It is possible he may have been of the Drynie branch from Inchbrakie. One of these commanded a regiment in the West Indies (see page 543). THE GRAHAMES OR GRAEMES OF KNOCDOLIAN, PANHOLES, CRAGIE. ARE ALL CADETS OF THE NOBLE HOUSE OF MONTROSE. On the Grahams descended from Malise, first Earl of Menteith it is impossible to touch on a volume of the space; they form a numerous clan of many houses. With deep regret I have turned from the story of the Southern Grahams of Esk of Netherby, of Norton- Conyers, and of Kirkwall, etc. this must be told by some worthier voice than mine, who can better sing the history of that borderland, where every billowing hill unfolds a story, and every " keep" its tales of have and hate!